Third year forward David Levin led the way through February picking up two monthly awards with 6 goals during the month. The Sudbury Wolves are pleased to congratulate all five our February Player of the Month award winners. The recipient of the TESC Hardest aWorking Forward for February is Macauley Carson. 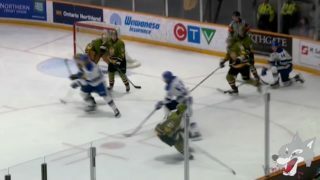 The Midhurst native had an outstanding month of February, notching 9 points in 9 games including 4 goals and 5 assists. The third year forward had an unfortunate start to his season due to a serious injury but is back in full form. The Wolves would like to congratulate Macauley on his hard work, engagement and determination that he has brought to each and every game throughout the season! Doug Blaisdell is the TESC Hardest Working Defenceman of the Month for February. Doug has had a consistently strong defensive presence on the blueline this season. This is Doug’s third time on being honoured with this award this season and the overage defenceman has been a great addition to the Wolves’ blueline since his acquisition from the Kitchener Rangers earlier this year. Doug has almost doubled his point production from last season with 11 assists. He consistently provides strong leadership on and off the ice to the young blueline. The Wolves would like to commend Doug on his energy and strong work ethic that he brings to the team every shift. Third year forward David Levin has been named the Skater’s Edger Player of the Month for February. David was selected by the Wolves 1st overall in the 2015 OHL Priority Selection. In 9 games throughout the month of February, David had 8 points, including 6 goals. The Israel native is a big part of the team every night and is eligible for this June’s NHL Entry Draft. The Sudbury Wolves would like to acknowledge David for his outstanding performance and dedication this past month and for battling through adversity this season with an injury that kept him out of the line-up earlier this season for almost 6 weeks. David Levin also won February’s Molson 3-Star Player of the Month. 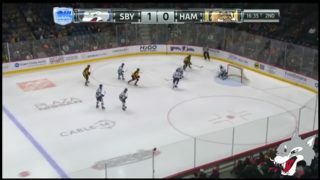 The 18-year-old was named the first star of the game on February 9th against the Flint Firebirds when he notched a hat-trick over the Western Conference rival. On February 17th, David scored once and added an assist en route to being named the second star of the game. The Israel native was also named the third star of the game on February 23rd against the Kitchener Rangers where he had one goal and 5 shots on net. The Sudbury Wolves would like to recognize and congratulate David on his outstanding play in February. Ilderton, ON, native Shane Bulitka, has been named the Wolves United Community Player of the month for February. Bulitka was very busy in the community this past month as he participated in a number of school visits including a stop at Chelmsford Public School where he read to students. Shane also attended the Backyard Rink promotion to play shinny with a local family this past weekend and met with fans at the Real Canadian Superstore earlier this month during the Meet and Eat. As a member of the Wolves, Shane also met with fans during the Family Day skates here at the arena. Shane was selected by the Wolves in the 2nd round of the 2015 OHL Priority Selection. He has already surpassed his point totals from last season with 26 points in 58 games and still has 9 remaining. The Wolves would like to recognize Shane’s exceptional leadership on and off the ice and are pleased to have him as a member of our organization and the Greater Sudbury community. The February Reg Wilkinson Scholastic Player of the Month is recently acquired defenceman Peter Stratis. The Scarborough native attends the Blyth Academy through correspondence taking university level courses. During the first semester, Peter achieved an average of 87% in English and Calculus & Vectors. He is currently enrolled in grade 12 biology, grade 11 physics and an Elite Athletes Program. 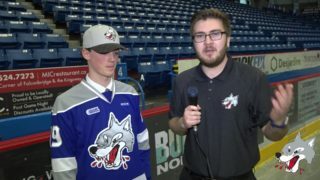 The 18-year-old defenceman was acquired by the Wolves just prior to the Trade Deadline in January from the Ottawa 67’s where he was a 1st round pick (11th overall) in the 2016 OHL Priority Selection. 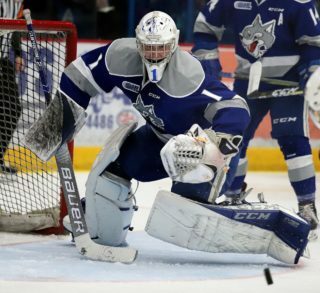 Stratis is eligible for the NHL Entry draft this June which is set to take place in Dallas. 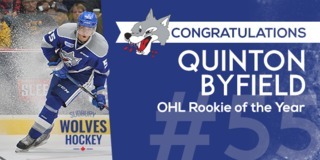 The Sudbury Wolves would like to congratulate Peter on his strong performance on the ice and in the classroom. On-ice Player of the month presentations will begin on Friday March 9th when the Wolves welcome the North Bay Battalion to the arena for their final visit of the season at 7:05pm. 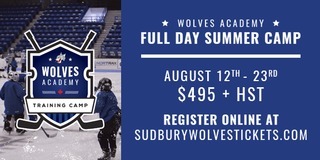 Tickets are on-sale now at the Sudbury Arena Box Office.